Saturday, May 26, 1888 Quite mild, but clouded over with some rain P.M. Our folks all appear as well, & of course rather extra busy. Same man here most A.M. finishing small jobs plastering & more white-washing, finished in our sitting room so I had time to brush up &c last of A.M. at which with usual chores, I spent most of time with knitting & some reading. Think Mrs McNaul was Charlotte's only caller this P.M. Sunday 27 Cool & cloudy, with light rain. Much same with our folks & on hand in good season. 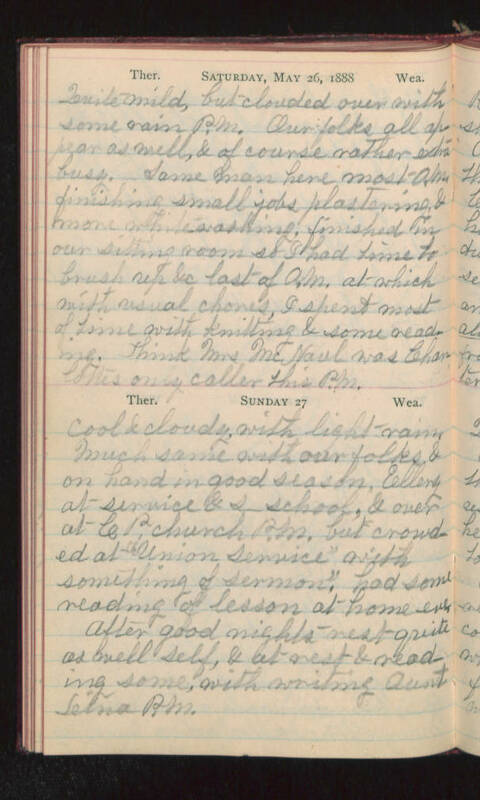 Ellery at service & s-school, & over at C. P. church P.M. but crowded at "Union Service" with something of sermon", had some reading of lesson at home eve. After good nights rest quite as well self, & at rest & reading some, with writing Aunt Lina P.M.